The backbone behind the operation of every organization is its workforce. Hence, attendance management of the workforce is most critical for the smooth functioning of the business. Accurately managing employee time and attendance is a duteous and necessary function of every business. Processing data on time for salary disbursement and maintaining workflow are equally important. To complete this vital task with ease and precision, organizations should move from a manual tracking method to a more reliable solution. The key to keep track of employee attendance is to rely on attendance app or a biometric attendance software. An attendance app for employees helps track and monitor when employees start and stop work without much manual intervention and with accuracy. It enables an employer to record their employees? working hours and arrivals and departures, the duration and number of breaks, and nonattendance. Compared to access passwords and access cards, biometric attendance system provides a much reliable way of tracking attendance. Because in both access passwords and access cards, there is a huge risk of the code or card being shared, unlike in biometric attendance systems, which use a person’s unique identification by evaluating one or more distinguishing biological traits or identification. Fingerprints, hand geometry, earlobe geometry, retina and iris patterns, voice waves, DNA, and signatures are used as unique identifiers. A biometric finger print scanner system works very efficiently and quickly. It takes an image of a finger and saves it in the form of biometric encrypt key, a series of binary code for verification purpose. The algorithm thus formed is totally impossible to duplicate. The biometric attendance app determines whether the pattern in the image entered matches the pattern in pre-scanned images. 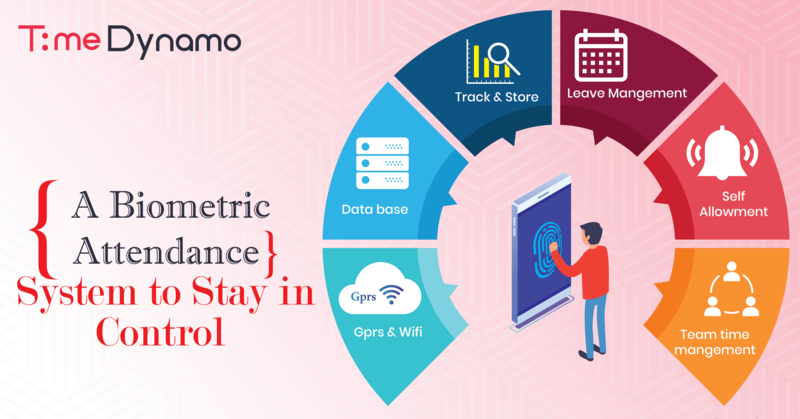 A fingerprint attendance system software helps both employers and employees to track daily attendance and regularize it, and approve or reject leaves as they are connected to an attendance app that records the data captured and can be viewed from the app interface. The data in the attendance app is updated by the biometric attendance software whenever an entry is made in the biometric system. 1) How many employees are to use the attendance app? 2) Do you need a basic time sheet or detailed data? 3) How much is your spending capacity? 4) Do you want online or on-site support? 6) Is the system compatible with browsers, telephones, and mobiles? 7) Is the interface simple to manage and execute? 8) Does the machine provide all the detailed information in real time? Once a product gets a check on all the criteria, you know you have found the right product for your organization. However, you should keep in mind that the Biometric System has two parts to its functioning. and the second is the one that makes ‘Software’ for the machine that records, stores, and organizes the data. So it is very crucial that both parts should be compatible for smooth functioning of the system. To cut the long story short, if reliability and accuracy are what you are looking for, then a biometric attendance system should be your go-to!